Absolutely Fabulous: Joanna Lumley and Jennifer Saunders on fame, politics and Patsy and Eddie. 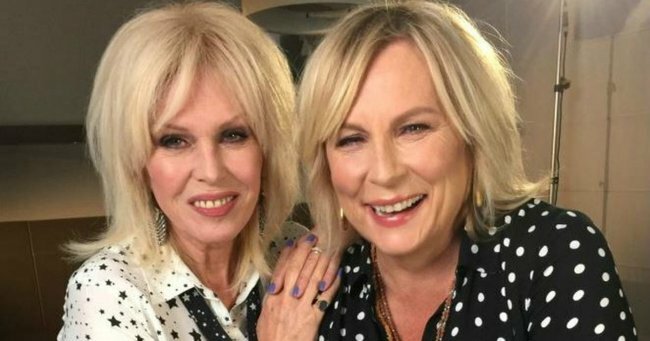 Jennifer Saunders and Joanna Lumley, the stars of the cult hit TV show-turned-movie Absolutely Fabulous, say the script for the film was finally written because of a 100,000-pound bet. Saunders says she then forgot to ask permission from supermodel Kate Moss if the main plot line for the film could revolve around her death. Saunders, who played alcoholic PR agent Edina Monsoon, and Lumley, who played her best friend, the even more drug and alcohol-addicted magazine editor Patsy Stone, have dished the dirt on their on-screen characters. Lumley and Saunders want you to know that their Absolutely Fabulous alter egos, Patsy and Eddie, are not very nice. “It’s sad for them really. Because they don’t cope with life. [Edina] especially doesn’t cope with life when she hasn’t got money and she hasn’t got some status. These are horrible women. They don’t care about anybody but themselves,” Saunders said. Lumley says Patsy, the drug-addled former model, is awful. Saunders says she was forced into finishing the script for the Absolutely Fabulous film after her comedic partner Dawn French bet her 100,000 pounds on live radio that she would not do it. “I don’t know why I took it. But it made me write it. Six months in I was panicking, eight months in I was sweating, 10 months in I was really sweating. And I managed to do it in the last month,” she said. According to Lumley, they had been wanting to make the film for years but the original script was pretty basic. “It said: ‘Doing a film, would you like to be in it?’ She said: ‘You better send me a script’, so I sent her the script, she sent it back and said ‘yeah that’s cool’. Lumley has been approached several times to run for Mayor of London, but she says she has no desire to enter politics. “If I’d wanted to be a politician I would have started long ago. I couldn’t bear it, I literally couldn’t bear it. I’ve had glimpses over the years into what politicians have to do, it’s a thankless job, everybody hates you for a start. I want to do good to people, but I hope in a way if you’re ever effective, outside politics is better. Inside is too slow. Lumley led the campaign for Ghurkas who had served in the British Army to be given the right to settle in the UK. She is also broadly aligned to about 70 other charitable causes, and she says the purpose of fame is to bring attention to such causes. Saunders says it is depressing and wrong that women still aren’t paid as much as men in the entertainment business. “I think commercially they’re wrong. Because when something like Mamma Mia comes out and it becomes the best selling movie of all time and everyone’s shocked but they then don’t try and reproduce that, they go that must have been a one-off. They forget that actually there’s a massive female audience out there that goes to the movies. Watch the interview with Jennifer Saunders and Joanna Lumley on Lateline at 9.30pm (AEST) on ABC News 24 or 10.30pm on ABC TV.